March 20, 2018 – Kansas City – Boulevard Brewing Company today announced that its beers will be soon be sold throughout the state of Nevada. The Kansas City brewery has appointed Breakthru Beverage Nevada to distribute its brands. With the addition, Boulevard beers will be available in 40 states and the District of Columbia. 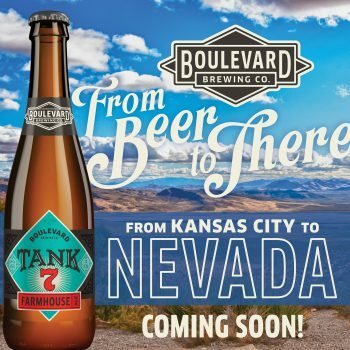 Many of Boulevard’s most popular beers will be available beginning in April, including Tank 7 Farmhouse Ale, Unfiltered Wheat Beer, Tropical Pale Ale, along with a variety of seasonal and limited releases. Breakthru Beverage Group is a leading North American beverage wholesaler driving innovation in the marketplace with a nimble and insightful approach to business. The company represents a portfolio of premier wine, spirit and beer brands in the United States and Canada. Family ownership is active in the business and committed to being stewards of heritage and champions of innovation. For more information, visit www.BreakthruBev.com.